Today’s bounty is very, very green. 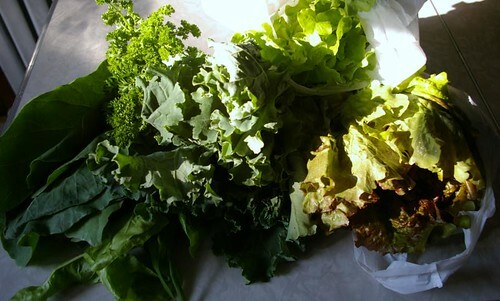 I received collard greens, kale, lettuce, parsley and swiss chard. I also, like the past 2 weeks, can go pick a quart each of peas and strawberries, and I’m looking forward to doing this on Sunday. There is always recipes included with our share and this week one of the recipes was for a kale and white bean soup. Conveniently, I had all the ingredients and in the pot they all went. About an hour later, I had the most tasty soup. With a bit of bread and some parmesan cheese, nomnom. In a big pot, cook a small onion’s worth (white and/or red onion), red pepper flakes and 2 minced garlic cloves in some olive oil. Add 4 cups worth of chicken or vegetable stock. Bring to a boil. Add 5 to 10 chopped kale leaves, bring to a boil and simmer for about 15 minutes until the kale becomes tender. Tomorrow I’m looking forward to another delicious green salad with some lettuce, spinach and some radishes! i made this tonight, but added 3 small yukon gold potatoes (peeled and chopped) about 10 min before i added the kale, then i also added a chopped tomato w/ the beans. (I had to up the broth by 2 cups). i served it with toasted garlic/parmesan sourdough bread. it was DELICIOUS and boyfriend approved. thanks for the inspiration. ok, YUM! I don’t think I’ll get Mike to try it but it sounds good to me. Our farmers markets are starting this weekend and I’m looking forward to trying this soup thanks so much for sharing Val! Apparently Kale is the best veg for keeping you healthy over Winter. We’ve got heaps growing and I’ve been trying to decide what to do with it. Thanks for the inspiration. I love the idea that your CSA comes with a recipe.